The prominent Syrian human rights activist and government critic, Haitham al-Maleh, has been released from jail. His release comes after President Bashar al-Assad issued an amnesty for those convicted of minor crimes and prisoners over the age of 70. Mr Maleh, 80, is reported to be unwell. He was sentenced last July for three years for spreading false information and damaging national morale - charges commonly levelled against critics of the government. On Monday, before his release, Mr Maleh and 10 other activists signed a petition calling on the Syrian authorities to end all political detentions. 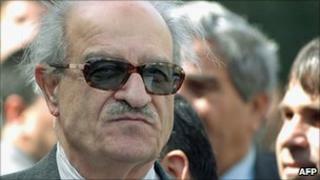 "My release is only an end to the wrongful and unfair decision to imprison me," Mr Maleh told the BBC. "I will only have my rights back when I am compensated for the years I spent in jail and when the institution that punished me is sued," he said, referring to the military court that sentenced him. Mr Maleh, who arrived at home on Tuesday morning, was due to go on hunger strike today, joining other activists who have started the strike. Reflecting on the wave of change sweeping the region, Mr Maleh said the Syrian government should act quickly to make reforms. "They cannot keep their eyes closed as if nothing is happening," he added.